George didn’t make our radio call this morning but called Dave yesterday and said he didn’t think it was going to work to get me off the island by the first. I was pretty distraught. I am thoroughly tired and cold. I was mean to a bird who was being uncooperative and then was ashamed of myself. I pulled it together for another call at 1315 – George was more positive and thought I could be back in Barrow in time to make my original flight on the 30th. I am now wearing both sets of long underwear, two bottoms, and two tops as well as two pairs of socks. There was snow on the ground this morning and squalls moved through all day. The thermometer stopped working and I’m a little bit glad that I don’t know the temperature. I am looking forward to being warm and dry on a regular basis. 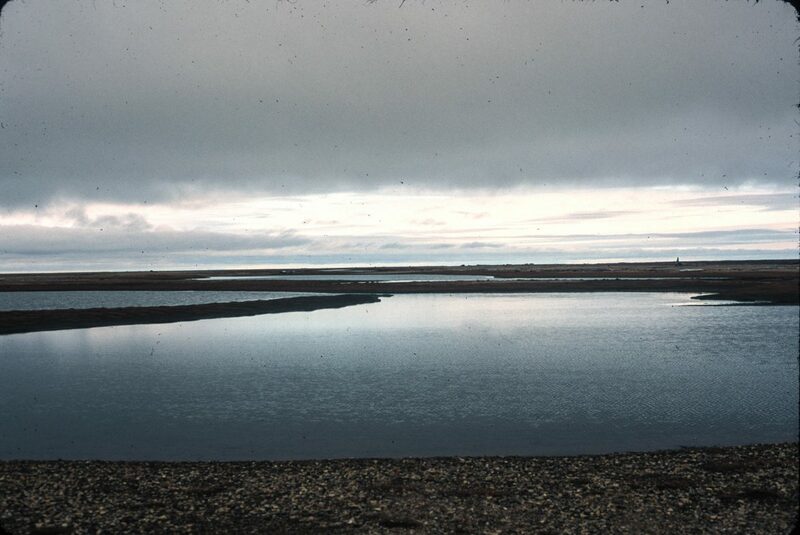 The colony is quiet – the terns and Sabine’s are gone. Even the phalaropes disappeared today. The Black Guillemots are subdued – no one fledged yet but my down and feather collection duties are rapidly dwindling. Soon it will just be measure and weigh, weigh and measure. I think tomorrow is the last day for down. George said rarely do chicks stay past a wing length of 140 mm and there are several in the high 130s already. I wonder if it is just the residual storm effect that keeps them here? I walked some tonight, but other than nest check mostly stayed in the tents. I read a bunch of essays in the Birder’s Handbook (why haven’t I been reading them more through the summer?! ), read WildEarth, and On the Road by Jack Kerouac – not quite done with it yet but getting there. Now there is lots of good reading time. It’s too cold and quiet to walk so much. And my knees are beaten. Silent, windless, calm day. How wonderful! There was a long, light snow this morning – very fine but enough to dust everything white. And no wind, not a breath. The lagoon was a flat mirror. The ocean was barely flowing, that gentle, smooth undulation of incipient waves rolling through water too dense to respond to weak pushes. The superior images made everything dreamy, and that incredibly precise, sharp quality to the air returned so that I could see ducks on the water all the way across the lagoon to the bluffs and their images on the ocean horizon. There were long lines of eiders hurrying in single file – double rows of them – the actual flock and the image above. Weaving, opening, and closing the gaps between sky and water, the wave of motion moving through the lines in mirror images from front to back. Always just at the edge of the horizon, often defining the line between sky and water. As Craig said the other day, “That’s the Arctic.” The eiders define it all so well. What better symbol of the fecundity, the mobility, the vitality of the Arctic than that ever-flowing single file of eiders in August? The snow buntings are fun. They have been flitting around the camp in great hordes the last week or so, 15 to 25 of them, fluffy, puffy, downy, white flashes of vibrant spirit. They wake me in the morning, calling, singing, standing on the tent over my head and chirping, fighting, and chasing each other around and about. They make me smile every time I see them. I enjoy their company and their perkiness. It was silent today. Two or three planes. That’s it. Several boats went by on the flat waters, but I couldn’t hear them. My crunching steps and breathing were the only breaks in the stillness. The passing snow flurries that went through this afternoon dampened everything that much more. The past few days have been utterly still and calm, gray and cloudy with passing flurries and showers but little wind. I’m suspicious of this newfound and continuing calm. I think it is holding out for next week to let us have it. I’ve been too tired to enjoy it, too, unfortunately. Yesterday I walked for a short while down on the tundra, but mostly I’ve read in the cook tent or the sleep tent. I sat outside for several hours this afternoon and read there, too, until I was too cold. I finished Jack Kerouac’s On the Road last night. Good read. Read the Pilot’s Wife today. Not a classic but spellbinding, in its way. I read about four pages last night and then the rest of the book this afternoon. The island is quiet. Few birds are left, dunlin and turnstones. No terns, no Xena, almost no glaucous gulls. The Jaegers persist. The puffins circle. I broke a chick’s wing the other day. I was so tired and angry and frustrated – the end of the field season exhaustion rising to set me off with one chick too many squirming, fighting, shitting, and evading me. I vividly remember what happened although I didn’t realize at the time what I did. It was the chick I said I had been mean to, was ashamed about. It kept squirming and squawking and fighting and I held it hard against my body to get it to settle down, hoping it would realize struggling was useless. Its wing must have already been at a bad angle and pushing it up against my body made it snap. I felt awful when I saw it the next day, but it wasn’t until a couple of days later that I connected all of the pieces and realized it had been my actions which caused this. Its wings are still strong, and it seems to be growing pretty well; I’ll wait until George gets here and decide what to do about it. If it is young enough and early enough in the growth stage perhaps it will mend and be able to fly. If not, perhaps George can take it back to the Seward SeaLife Center. I can’t believe how foolish I am. That day I kept trying to tell myself that it wasn’t their fault. They were just afraid and wary of me, and I should be more sympathetic, but the other side kept saying we go through this every day, don’t they get it? If they cooperate, I’m done in 20 seconds if I have to chase them and they resist it’s much harder on both of us. Alas, it wasn’t until I held that little bird against me so hard that I knew I had lost it and had to get control of myself. I can’t remember if I took a break right away or not – I certainly should have – I was ashamed. I didn’t realize, however, how much damage I did. I think I would not have felt so terrible if I had dropped one of these heavy nest sites on a little chick – at least it would have been quick and done, not lingering around with an uncertain fate. Two more chicks fledged last night. That’s five gone. They are all going to stay 40 days. I’m sure of it. Some of them are large – long wing chords if not high weight. I keep thinking that if the food stocks are going to crash, then the chicks that are large enough should go and seek their fortunes rather than depend on parents that are not providing enough. But how do you tell this to a guillemot chick? As each of the data columns for the older ones reaches the bottom of the page in the databook, I tell them it’s time to leave because I’m out of room for them in my book. They’re not listening.